Struggling Kidderminster Harriers have signed striker Harry White from League One side Barnsley. 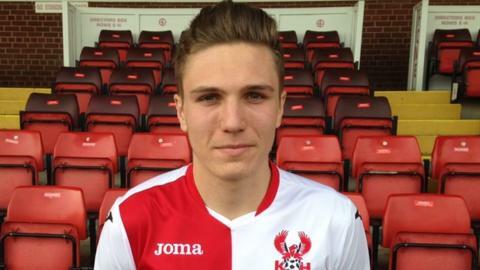 White, 21, is the second young striker signed by the National League's bottom club in four days. He follows Friday's arrival of Evan Garnett from Evo-stik Southern Division side Belper Town. Harriers, 16 points adrift at the foot of the non-league top flight, were in urgent need of more firepower up front, having not scored since Boxing Day. White has made just two substitute appearances for the Tykes, but has featured fairly regularly on the Barnsley bench. He had spells with Banbury United and Gloucester City, for whom he scored nine goals in 17 start last season, before joining Barnsley on August deadline day. He is available to make his debut on Saturday at Boreham Wood, when managerless Harriers, still under the interim command of chief executive Colin Gordon, hope to end a run of eight straight league and cup defeats.